I didn't sleep too well last night. Our friend Mary Grace who is from Birmingham, had asked to spend the night with us because she needed to be in Jasper early this morning. 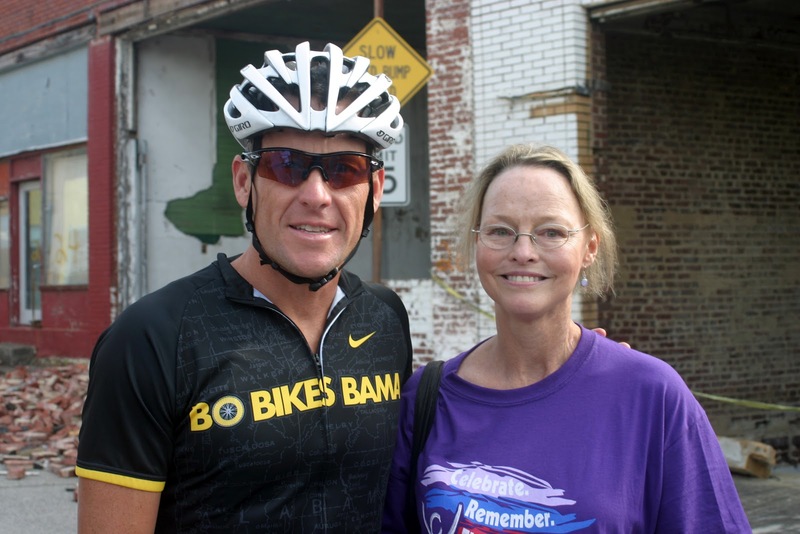 She'd gotten word that Lance Armstrong, the cyclist, would be riding to raise funds for tornado victims across Alabama. Today was the one-year anniversary of the destructive outbreak. She asked if I'd consider going with her to shoot a photo when he autographed her book. Meeting Lance was on her Bucket list. She's been fighting cancer for the last ten years, and his books and articles written about him resonated with her. She said his LiveStrong organization gave her information, and ultimately hope where little existed in her life. When we arrived this morning, there was over a hundred bikers, and no telling how many others who turned out to see Bo Jackson, and Ken Griffey Jr. and other celebrities. Lance's appearance was a surprise because it wasn't announced in the paper, but she'd heard from a good source that he'd be there. We found out from his assistant that he wouldn't be in Jasper, but he would be in Cordova, which was a town that was stricken by the storms last year. So we headed the few miles to Cordova. It was a madhouse when we arrived, but his assistant told her to be patient, they'd do their best to work it out so that she could meet him. To be honest, I had doubts that it would happen, because the crowd was so large. But true to her word, the assistant passed Mary off to one of the cyclists who apparently had clout with Lance, because he led her through the crowd, even brushing aside one of the TV station cameramen from Birmingham. He deposited Mary with Lance. He smiled graciously as she asked him to autograph a book and an article. During the five minutes she talked to Lance, I must have shot a hundred photos. to my knowledge, she was the only person who got a one-on-one photograph with him there. A few moments, later, they were off headed to Bessemer, and then to Tuscaloosa. Mary was floating on air, and she smiled all the way home. Jilda and I consider it a gift to have had a chance to help make something happen that was so important to her. So special ndeed, happy it worked! You indeed are a hero to many! So wonderful that she got her moment. How cool! It's great to have help in this fight and Lance would know how to do it having been there himself! I love it when things can be checked off the bucket list.